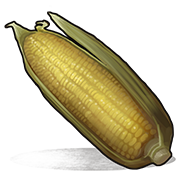 An ear of corn. Eating it provides a small boost to health, hunger, and thirst. You can find a lot of Corn near Rivers.